The self-regulating heating cable has a special conductive core between the two bus wires. This core becomes more conductive during cold ambient conditions; therefore the heating cable will increase its wattage per linear metre, in response to the cold. This feature makes it ideal for the freeze protection of exposed surfaces in the winter. This type of cable will also decrease its power output (watts per linear metre), in warmer conditions, when the higher temperature will make the special core less conductive. Although its called “self-regulating,” this cable will NOT turn itself completely on or off. So, we do recommend that some degree of control should be used with this type of heating cable (can be a simple led switch or a temperature controller). 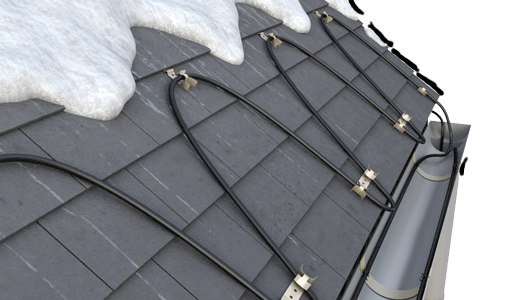 The cable is well suited for roof and gutter applications as well for pipe frost protection. This product comes with a 5 Year Warranty. We are completely confident in the standard of our products. Depending on the type of application there is a diverse range of accessories to fix the cable.